There is no ‘one-size-fits-all’ in cancer medicine, as every patient’s tumor is unique. Thus, it is important to understand the disease history as well as each single tumor in the best possible way. As every cancer results from somatic genetic changes, it can be considered a genetic disease. Identification of the genetic changes within the tumor provides valuable information for choosing the best treatment. We at CeGaT have fully committed ourselves to this aim. With our long-term experience in genetic diagnostics, we have optimized our somatic tumor diagnostics to identify the somatic changes in the tumor that are responsible for tumor growth, drug resistance, and that represent potential therapeutic targets. By using next-generation sequencing (NGS) technology, we analyze a panel of 742 tumor associated genes and selected translocations in 31 genes. Variations in these genes are known to have an important and significant impact on the pathogenesis and progression of tumors. We also determine additional therapy-relevant parameters, such as tumor mutational burden (TMB) and microsatellite instability (MSI). The generated data is summarized in a medical report that supports choosing the optimal treatment for each individual patient. Our somatic tumor panel is the first choice genetic diagnostics for cancer patients. Large panel approach: Full sequencing and analysis of 742 genes and translocations in 31 genes. High average sequencing coverage to detect subclonal variants: 500-1,000x. 1Based on high quality sample with 60% tumor content for detection of a heterozygous variant. Other sample material sources are possible on request. Please note: In case of insufficient sample quality or tumor content the analysis might fail. If you have more than one option of tumor samples, please contact us (tumor@cegat.de) and we will assist you in choosing the optimal sample for your patient. For highest accuracy we require tumor and normal tissue for our somatic tumor diagnostic panel. Please send back the order form, signed by the patient as well as by the requesting physician. Determination of TMB and MSI as a basis for therapeutic decisions on immunotherapies. 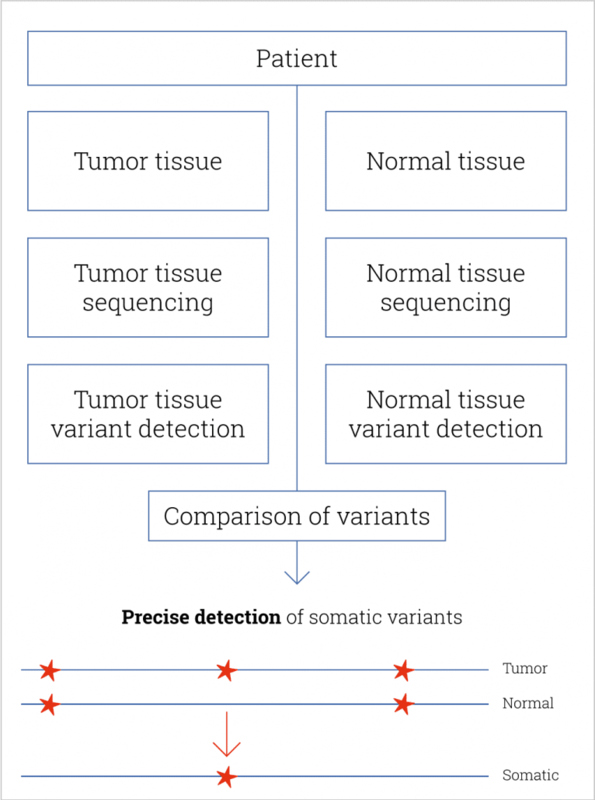 Cost-efficient analysis of the most important actionable variants in solid tumor entities. Panel designed for the diagnosis of hereditary tumor syndromes. Tumors develop from cells as a consequence of changes in genes, called mutations. These changes happen by chance and normally are corrected by the cell’s DNA repair systems. Exposure to carcinogens, such as tobacco smoke or UV radiation, increases the number of mutations. A not correctly repaired mutation can lead to cancer. These obtained mutations are called somatic mutations. Cancer promoting somatic mutations result in changed protein functions leading to dysregulated cellular processes. Initially, these genetic changes promote loss of growth control in affected cells during cell division. Additional mutations select for cell clones which successfully continue proliferation and decrease their rate of death. Further mutations accumulate in the course of tumor progression and promote tumor cell distribution to distant organs (metastases). The somatic mutations which are acquired by tumors in the course of the disease are individual and differ not only between different cancer entities but also from patient to patient. Thus, cancer is a multifactorial and heterogeneous genetic disease. Again: Every tumor is unique. The individual set of tumor-specific mutations helps the tumor to survive, reduce sensitivity to treatment, and develop resistance against therapeutic agents. Knowing the somatic mutations helps to identify promising therapeutic strategies and to avoid ineffective treatment options with their associated side effects. Currently, anti-cancer therapies are still mostly chosen based upon the organ of origin. However, recent studies show that comprehensive genetic tumor diagnostics provide therapeutically relevant information in over 76% of all tested cases (Frampton et al., 2013; CeGaT internal data). An increasing number of tumor therapies is available or currently tested in clinical trials. Many of these treatments address specific genetic mutations or effected pathways of the tumor cells. Thus, identification of genetic mutations or effected pathways is an important factor for personalizing the patient’s treatment and for finding new treatment options. The goal of our medical report is to assist the treating physician with choosing the best treatment. Therefore, we suggest treatment strategies based on the genetic variants in the patient’s tumor. This information is listed in a comprehensive table. In addition, for each genetic variant the effect on the respective protein is listed. Also, the subsequently effected signaling pathway, in which the mutated protein plays a role, is highlighted. Somatic changes in the tumor are responsible for tumor growth and drug resistance. At the same time, these somatic changes are targets for therapies. We list all somatic changes together with treatment strategies. which are restricted to the tumor (somatic variants) in comparison to the ones also present in the healthy tissue (germline variants). The only accurate way to determine variants in the healthy tissue is to sequence the matching normal tissue together with the tumor tissue. Methods trying to replace the sequencing of normal tissue by bioinformatics approaches fail to clearly distinguish between germline and somatic variants, especially when the tumor content of the sample is high. This is why we always sequence DNA from tumor as well as from normal tissue (mostly blood). 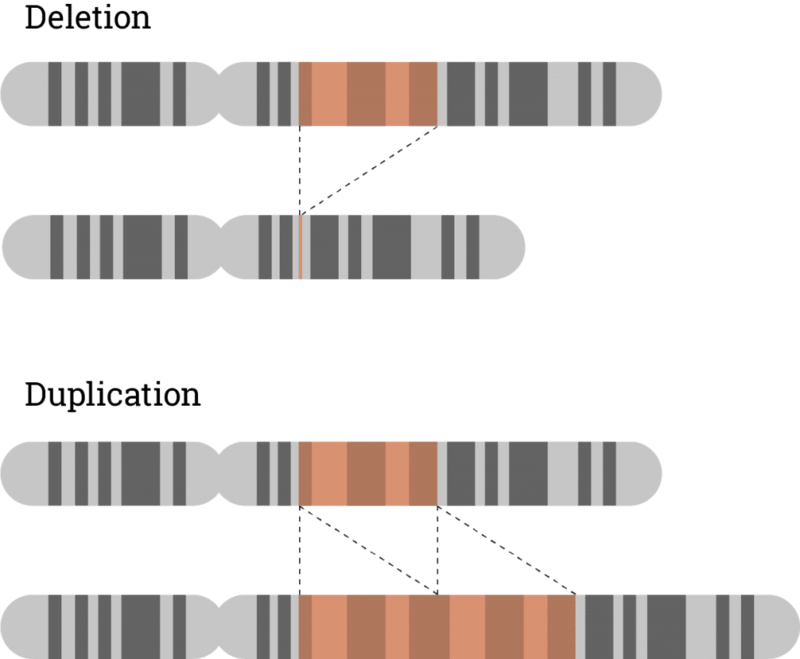 The sequencing data of both tissues are compared and thereby truly somatic variants are determined. Comparing tumor with matching normal tissue is mandatory for obtaining meaningful results. This has been shown by different studies (e.g. Yelensky et al., 2018 Jones et al., 2015). Diagnostic tests that do not analyze tumor and matching normal tissue usually give non-accurate results. We at CeGaT always sequence tumor tissue and matching normal tissue for our somatic tumor panel. Recent clinical studies have identified the tumor mutational burden (TMB) as reliable predictive biomarker for responses to treatment with immune checkpoint blockade (Hellmann et al., 2018). TMB is defined as somatic mutations per megabase (mut/MB). The higher the numbers of genetic variations within a tumor cell, the more mutated proteins are expressed. These mutated proteins are processed into short fragments (peptides) which are presented on the cell surface of tumor cells. Such mutated peptides are called neoantigens. Neoantigens are highly immunogenic. This means that they are very effectively recognized by immune cells, particularly by T cells. T cells are able to directly eliminate tumor cells upon antigen recognition. Therefore, the higher the numbers of mutations, the higher the chance that neoantigens are presented on tumor cells and thus the more efficient is tumor eradication by T cells. By sequencing the genes of our panel with high sensitivity, we are able to calculate the TMB. This metric is used to classify tumors into groups with low, medium and high mutational load. Calculation of TMB is part of our medical report. We list the classification of the TMB, as well as the exact mutation rate of the tumor sample. MSI (microsatellite instability) is another important parameter for response to immune checkpoint blockade. Microsatellites are small repetitive sequences of DNA locatedthroughout the genome. Thesize of microsatellites can be altered (microsatellite instability, MSI) due to failures of the DNA mismatch repair machinery. Presentation of tumor cell-derived somatic peptides. Somatic mutations arise frequently in cancer and permanently alter the genomic information. These genetic changes can result in expression of proteins with altered amino acid sequence. These, peptides which carry a somatic change, and thus display a particularly strong immunostimulatory potential, can be presented on the tumor cell surface and cause an effective anti-tumor immune response. Reliable determination of TMB and MSI is a basis for therapeutic decisions on immunotherapies with checkpoint inhibitors. Therefore, a high-quality analysis of TMB and MSI is an integral part of the comprehensive medical report at CeGaT. TMB/MSI determination is the basis for off-label use of checkpoint inhibition independent of the tumor entity. Cancer arises as a consequence of aberrant cell behavior with respect to cell growth and survival. Both processes become uncontrollable in the course of tumor development. Normally, all cellular processes are strongly regulated and controlled by a complex network of signaling pathways. Tumors are characterized by an accumulation of mutations in genes which fulfill key roles in this complex signaling machinery. Mutations in specific genes lead to pathologic and cancer-promoting signaling. Moreover, a single genetic alteration can affect multiple pathways. Thus, next to the detection of disease-associated mutations, it is crucial to understand the interplay of signaling pathways, which are affected by the genetic variants. This approach is necessary in order to identify possible bypass strategies of a given tumor. By doing so, all possible therapeutic options including effective combination therapies can be considered. Therefore, our comprehensive somatic tumor panel covers important signaling pathways which are known to be frequently genetically dysregulated in different cancer types. Moreover, our medical report delivers a comprehensive depiction of relevant cancer-related pathways and their molecular “key players”. For each patient all relevant genetic alterations and available drug classes are highlighted in the signaling pathway depiction. This strategy facilitates the best possible treatment decision support. Tumors are characterized by an accumulation of dysregulated processes – detecting these makes the tumor vulnerable. To counter possible bypass strategies within a tumor it is important to understand the crosstalk between different pathways. Therefore, we at CeGaT provide a comprehensive depiction of cancer-associated signaling pathway network within our medical report. Cellular processes are tightly regulated. This regulation depends on the correct function of genes. In tumors the copy number of genes is frequently altered thus impairing the correct function of affected genes. Increasing the copy number of a gene can increase its activity while (partial) deletion can result in a loss of function. Therefore, chromosomal aberrations leading to copy number changes can also have therapeutic consequences. In tumors copy number variations (CNVs) are frequent due to the overall genomic instability. Here large chromosomal parts are often either deleted or amplified. It is important to understand these deletions/amplifications and know the genes in the affected region with therapeutic relevance. Based on the NGS data obtained, deletions and amplifications are detected. Deletions and amplifications, together with the affect­ ed genes of therapeutic relevance, are listed in the be­ginning of the report. 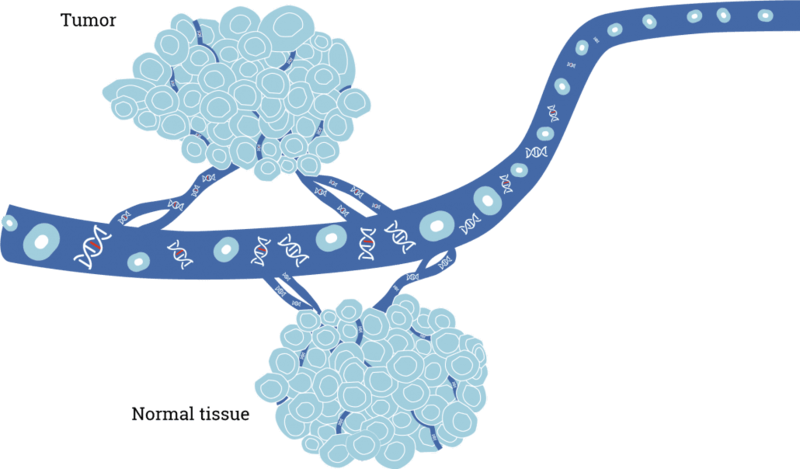 CNVs often play an important role in tumor genetics. Knowing the changes in CNVs assists in choosing the optimal treatment. Therefore CNV analysis is an integral part of CeGaT’s somatic tumor diagnostics. Liquid biopsy is a method to access tumor DNA when surgery is not possible. Another important aspect is that a tissue sample only shows a part of a tumor disease. It is a single snapshot of a tumor over time and space and usually does not consider the tumor overall heterogeneity. Liquid biopsy has the potential to provide a more complete genetic signature of the patient’s entire tumor burden. This is because tumor material, such as cell- free tumor DNA (ctDNA), is released from all parts of a tumor and all tumor sites in the body into the circulation. Currently, the best approach for liquid biopsies implements is using ctDNA from blood samples. Note: cfDNA referrs to the sum of all cell-free DNA, regardless if derived from normal tissue or tumor tissue. ctDNA referrs to DNA derived from tumor tissue only. However, it should be noted that ctDNA cannot be distinguished from cell-free DNA derived from normal cells. Therefore, the tumor content in the sample can only be determined after sequencing. Samples with a low fraction of ctDNA to cfDNA (<20%) cannot be used for analysis, We at CeGaT have established and validated liquid biopsy analysis of cell-free DNA as a regular product. We offer our full somatic tumor panel using ctDNA from blood samples. Following the literature (Corcoran and Chabner 2018) and considering the limitations of the liquid biopsy approach, we recommend in the first place using a standard tumor tissue sample and performing analysis by liquid biopsy when no tumor tissue is available. The most thorough analysis of course is to analyze both – a standard tissue biopsy and a liquid biopsy sample concurrently. This approach would combine the robust detection of genetic alterations in tissue samples with the possibility to asses a more comprehensive genetic profiling of the entire tumor disease. Liquid biopsy offers the chance to get a complete view on the genetic changes from all tumor cells in the body. In addition, the genetic test can be performed when no other material is available. Which tumor entities can be analyzed by the somatic tumor panel? All tumor entities can be analyzed by our comprehensive somatic tumor panel. The panel covers all genes that are known to play a role in tumor development, growth and survival and might be dysregulated in tumors in general due to mutations. Besides, the composition of our Somatic Tumor Panel is frequently updated according to the latest scientific findings to ensure that always all relevant cancer related genes are analyzed. When is the right time for a genetic tumor diagnostics? The sooner the better! The longer the life span of a tumor is and the more therapies it outlasts, the more resistance mechanisms and survival strategies are developed by the tumor and the more difficult the treatment becomes. Ideally, a wide genetic tumor analysis is performed after the first diagnosis. The knowledge about cancer specific genetic alterations is crucial for the choice of the best treatment. Which tumor tissue should be used for the analysis – the primary tumor or the latest tumor tissue? Tumors acquire changes over time and with every therapy. To ensure that the genetic analysis provides the most recent molecular profile of a tumor we strongly recommend analyzing the latest tumor tissue, e.g. after relapse or progression during or after a given treatment. Thus, possible resistance and escape mechanisms that might be acquired by the tumor as a result of standard therapy are considered in the analysis and the subsequent treatment decision made by an oncologist. What if the latest tumor cannot be removed by surgery? In cases, where a resection of newly grown tumor mass is not possible because of a hard-to-access localization in the body, or because a new operation is considered too risky for the patient, we offer analysis of liquid biopsies (e.g. from blood): cell-free DNA (ctDNA) which is shed by tumor cells into the bloodstream is analyzed. In such cases, we ideally recommend the concurrent analysis of the available tumor tissue from original resection and a freshly obtained liquid biopsy sample. 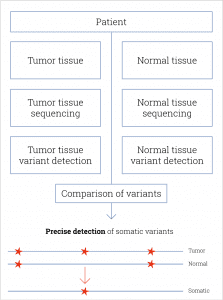 This approach enables a robust tumor profiling based on the tumor tissue and offers the chance to obtain a very comprehensive and recent picture of the tumor’s genetic landscape based on the analysis of the ctDNA. For testing of cfDNA (cell-free DNA) special blood collection tubes are required, please contact us. My patient had the tumor tested and treated accordingly but got a reoccurrence. What should I do? Optimal treatment of a tumor can require adapting after a certain time. The tumor might be able to adapt to the treatment finding an escape mechanism. In such a case a reoccurrence can happen and treatment needs to be adapted. Therefore a new sample should be analyzed in order to identify the changes that lead to the tumor growth during treatment. Based on the new findings the treatment can be adjusted. The samples sent in for analysis failed. What happened? Our tumor diagnostic service relies on high quality data. Sometimes the amounts or quality of tumor DNA is insufficient. Also the tumor content of the sample might be too low. In these cases we request alternative sample material. If no alternative sample material is available the analysis needs to be canceled. Logistics is very easy. CeGaT provides sample collection boxes that contain instructions and the appropriate collection equipment. Also the boxes can be used for shipment. The sample collection boxes are free of charge and can be ordered by mail or phone. What are the costs for the analysis? We are happy to provide prices on request. For German customers we can also provide information regarding reimbursement. Please contact us.